Written by American poet Emma Lazarus, these words, selected from “The New Colossus” and permanently etched in the lower pedestal of the Statue of Liberty, pledged a beacon of hope in foreign immigrants for the last few centuries. However, for many Americans, these words don’t seem to connect with the world’s most tragic humanitarian crisis happening before our eyes since World War II: the Syrian Refugee Crisis. Largely in part due to the calamitous effects of the Syrian Civil War and the brutality of the Islamic State, the crisis has left millions fleeing their homes in hopes of an improved life. Despite this, America has been skeptical from the beginning to grant these desperate people asylum. This hesitancy, however, reached an all-time high after the terrorist attacks in Paris on Nov. 13, 2015, in which the Islamic State of Iraq and Syria (ISIS) brutally murdered 130 innocent Parisians. Prior to the attacks, the 2016 presidential candidates were mostly in favor for accepting Syrian refugees. But immediately after ISIS struck in the heart of France’s capital city, many candidates immediately changed their positions. Republican candidate Donald Trump said mosques should be shut down, and Ted Cruz referred to accepting Syrian refugees as “absolute lunacy.” This is hypocrisy at its finest, as such ideas seem to contradict those of The New Colossus. So what drove these candidates to change their stance in such a drastic way? One of the driving factors in this hesitancy concerning Syrian refugees is fear of potential terrorism in the future having roots with a Syrian refugee. However, this is an unnecessary fear which is quite unjustified. First of all, the average screening process for the everyday refugee entering America is 18-24 months, and this is specifically longer for Syrian refugees amidst recent terror fears. This screening is intense and highly sophisticated. Many tend to underrate the complexity of the screening. Not only will these refugees be safely screened, but any terror roots will be thoroughly eliminated. Second of all, according to a report conducted by New America, almost twice as many American citizens have been killed by white supremacists and non-Islamic domestic terrorists than of Islamic Extremists in America since Sept. 11, 2001. If anything, we should be worrying less about possible terrorism in Syrian refugees and focus more on fighting homegrown extremists which pose a greater threat to society than any radical Islamists. Recent terrorism in the past couple of years in the United States also has extremely little linkage to refugee involvement. The Migration Policy Institute stated that terrorism committed by refugees has been almost nonexistent since Sept. 11, 2001. To be more precise, of the 784,000 refugees admitted to the US since this date, exactly three have been officially convicted and arrested on terrorism charges. That’s less than a hundred-thousandth of a percent. Refugees pose nearly no terror in America. Not only is America’s hesitancy with admitting Syrian refugees preposterously unjustified, it is not helping the crisis itself. Under all of these circumstances, why is the American Government so skeptical with the mere acceptance of these refugees? Time and time again statistics have shown that refugees pose almost no threat to domestic safety and that homegrown terror groups are a much more significant issue than any terrorists-posed-refugees. With all of this in mind, it is unclear why educated individuals such as those in the Obama Administration feel such suspicion towards Syrian refugees. Germany is officially granting asylum to about 40,000 Syrian refugees, while France is accepting close to 31,000. As one of the most powerful countries on the planet, it is time for the United States to stand up and do the American thing to do: accept these refugees and grant them asylum. 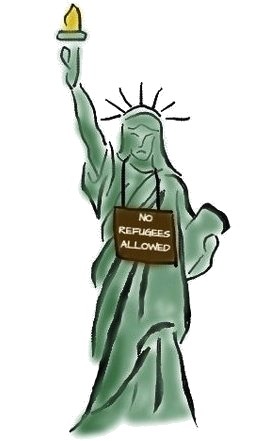 If we don’t do this soon, not only will these innocent refugees not have a safe place to reside, but The New Colossus on the Statue of Liberty will become a symbol of hypocrisy and dishonesty rather than patriotism and acceptance.